Rose: I was born on Long Island, Bahamas. Entered the United States at the age of 6 as the adopted child of American citizens. So, I suppose that, in view of all the present immigration issues, I can truthfully and proudly claim immigrant status. I am presently a resident of Los Angeles County CA. Copa: What were your majors? Copa: Have you always wished to become a writer? ​Rose: No,I enjoyed penmanship early on in my primary school days. Once my mother taught me cursive writing, I was enamored by the flow of words on paper. The feeling of a pencil between my fingers and the result of the words taking form on the page fascinated me. I especially took pleasure in writing essays in school from the fourth grade forward. Dreams of one day becoming an accomplished writer never crossed my mind. Copa: How would you describe your character in your youth? ​Rose: I grew up as an only child with parents who doted on my every accomplishment, but I was quiet and withdrawn for the first few years of my new life. I spoke with an accent, and looked quite different than most of my classmates so I did not make friends easily. But once that period was over, I grew out of the shyness and became the extrovert that I am today. Copa: Was life interesting for you growing up in the Bahamas? ​Rose: The first 5 years of my life growing up in the Bahamas cause me pause each time that I am forced to extract the thoughts from my memory bank. Those early memories are not pleasant ones, but they helped to mold my character for the person I have grown to be. It was not until I was living in the new family I was given abroad and spent yearly summer vacations in Nassau that positive memories were made. Copa: Who was the most influential figure in your youth and why? Rose: There are three people in my youth who played such important roles in my youth: Idella and Raymond Baker (my parents) and Alice Eva Adderley Miller (my maternal grandmother) Since I must choose one, it would most certainly be Grandma Alice. She and I would spend days in her restaurant talking about the important things in life as she taught me to cook, bake, and clean. She was the one who taught me the fine art of walking with my head held high; of the many pitfalls of disobedience; how to properly sit in the presence of young men; she introduced me to the birds and bees. I still carry our conversations in my heart to this day. And each time I speak of her, my heart overflows with love, respect, and honor to her memory. Copa: Who encouraged you to write your first book? Rose: My youngest child, Leonel, encouraged, or I need to say, demanded that I write their story. He called me one day and voiced that every time he was asked about his life and that of his siblings, the suggestion came in the form of “Your mom should write a book.” He wanted to be able to answer once and for all “Actually, she has!” Little did he know that I began writing that very evening and did I the first 100 pages with the flourish of 3 pens! Once I began writing, it was difficult to stop. The words just seemed to flow so very easily on the legal pad. Later, I discovered that writing “MOM3MD” was more therapeutic than merely putting words on paper. As I wrote, I realized that there were issues in my story that I was forced to address. Issues that I had put on the back burner of my life that was now coming to the surface. Thank you Son! Copa: Would you say that you are responsible for all three of your children becoming physicians? 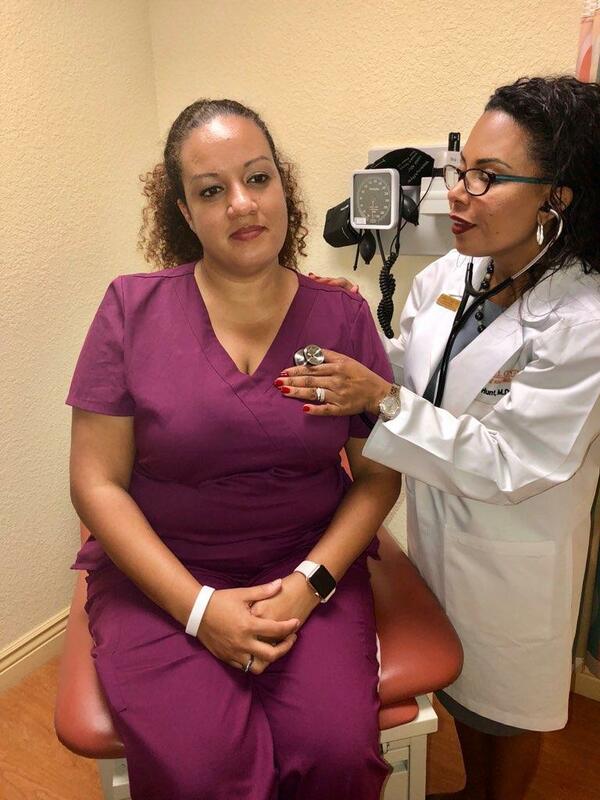 ​Copa: I am reluctant to admit that I cannot, with good conscience or straight face, that I am responsible for my children all becoming physicians. That honor belongs to the man who shared their life for a very short period in their lives. The man who influenced them to have a desire to complete a legacy he did not live long enough to execute. I am sure that if each of them were asked this question, the answer would probably be “my mother.” I am certain that their loving and devoted father planted the seed, however subconsciously. I was granted the task of nurturing the seeds with all the devotion and care possible. I even made the promise to do so. Our children became physicians to be of service to humanity. I am honored and proud that they feel so deeply about carrying on the legacy of their father. I do take much pleasure in admitting my very small part in helping them to become the fabulous, magnificent human beings that they are today. 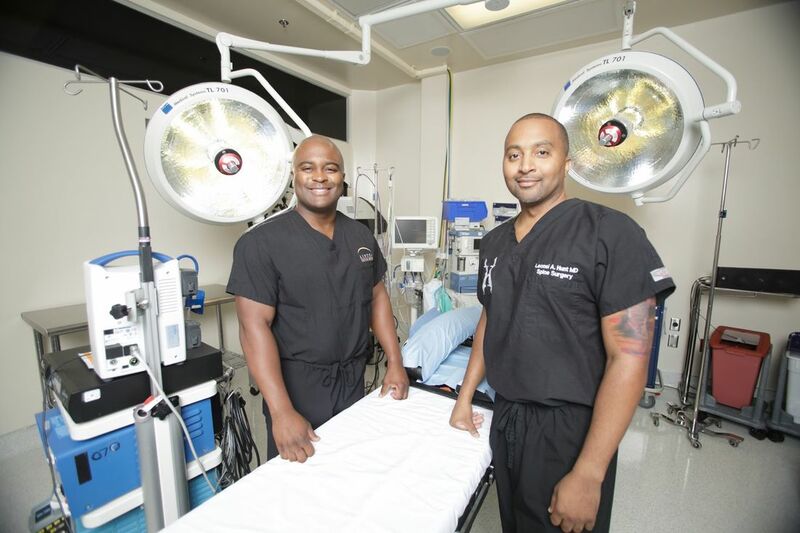 Dr. Gabriel Hunt, Jr. and Dr. Leonel Hunt in surgery. 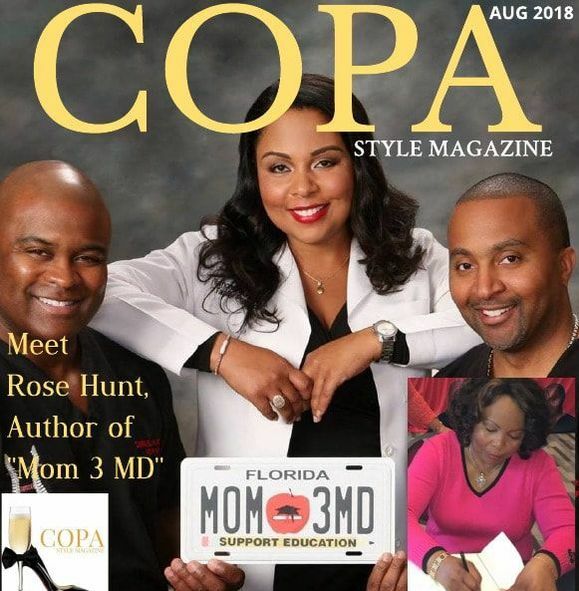 Copa: How did you successfully balance raising 3 kids as a single parent? Rose: Life has a way of throwing us curve balls when we least expect it. My curve ball came from the pitcher’s glove at 1,000 miles per hour. I could either duck, step out of the batter’s box, or swing! I chose to swing. I missed the ball and drew the strike. I made the decision to let the next pitch go by. Another strike! Next three pitches were balls. On a full count I was determined to at least get to first base. I closed my eyes as the next pitch left the pitcher’s glove. I swung with all my might, the bat connected with the ball. To my utter surprise, as well as the spectators in the stands of our lives, the ball traveled out of the park of trials, tribulations, victories, and defeat, into parts unknown. My children and I have made it into the history book of life. The success I experienced in balancing the feat of raising 3 kids as a single parent came as the result of faith in a Supreme Being, sacrifice, and dedication to the “PDRLs of Life” i.e. Patience, Perseverance, Discipline, Respect, Loyalty, and Love. Success manifested itself in the respect, love, and honor that my children had for their mother. They trusted me with their lives, believing when I told them that nothing in this world was more important to me than the three of them. I ruled with “an iron fist.” Take that in any context you may. Naysayers criticized me as being too strict a disciplinarian and ridiculed me. I was not distracted. 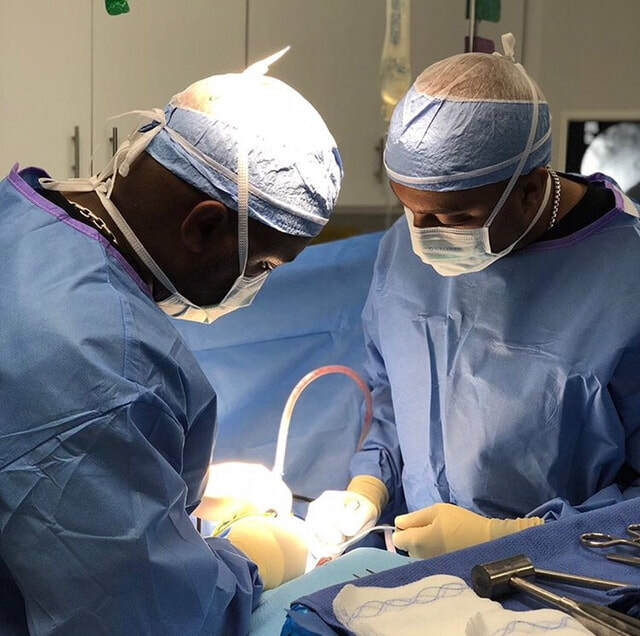 The proof is in the proverbial pudding: one neurosurgeon, one orthopedic spine surgeon, and one family medicine physician. Copa: When did you inform your children that you were going to write a book about them? Rose: After completing the first draft, having it bound, I presented each of them with their own personalized copy. I had the manuscript copyrighted in 2008. I then put it out of my thoughts and on the shelf. I had done it and told them that they were at liberty to do whatever they desired with it. It was not until 2014 that my daughter asked when I planned to publish the book. She was determined to get it done and soon convinced her brothers of the idea and they financed self-publishing. It was a wise decision. Copa: How was your book received by the public? ​Rose: "MOM3MD" made the publisher’s Best Seller List the first month after release. It is on the shelves of two county libraries in my hometown. I am pleased that it continues to make a difference in the lives of my readers. I receive rave reviews, letters of appreciation and gratitude from patients of my children who have read their story. All proceeds from the sale of the book go directly to The Hunt Foundation to help in its quest to bring needed healthcare to the undeserved population of developing countries. The foundation is currently working in Addis Ababa, Ethiopia. But has plans to go wherever needed. Copa: At what time did you decide to write a children’s book and why? Copa: Did you find writing your second book more of a challenge because of the subject material? Copa: In your opinion, what makes kids special? ​Rose: In my opinion, kids are special firstly, by virtue of their birthright; there is nothing in this world that is more special than holding a newborn baby in my arms, looking down into the face of the beginning of a new generation of mankind. Knowing that this life is in my care, to mold and fashion into the most magnificent human being possible. To help develop the character that will be of service to him/herself and the world. I say, what is more special than that? Perhaps there is something…the conception of this life by parents who know beyond the shadow of a doubt that they did something great for humanity. Secondly, kids are so very special by virtue of the fact that they are the future of the world. They have their own brand of love, devotion, caring, and giving. I was dubbed “The Pied Piper” of my neighborhood during my youth because I could get the little ones to follow me anywhere. I could spend hours on end reading to and playing with my neighbor’s children. Now, I am referred to as the “baby whisperer” because there is no crying baby’s tears that I not able to conquer, to this present day. Some of the greatest and most satisfying moments in my life have been when I made a difference in the life of a child. Copa: Is there another book in the works? ​Rose: How did I anticipate this question? I have completed the preliminary manuscript for a third book. This is first mentioned here and now. The Spanish version manuscript for “Mimi’s PDRLs” is in the primary phase. Transcription is completed. Copa: What does the future hold for Rose Hunt? Jordan wants to do chapter books. We shall see. Stay tuned for updates! 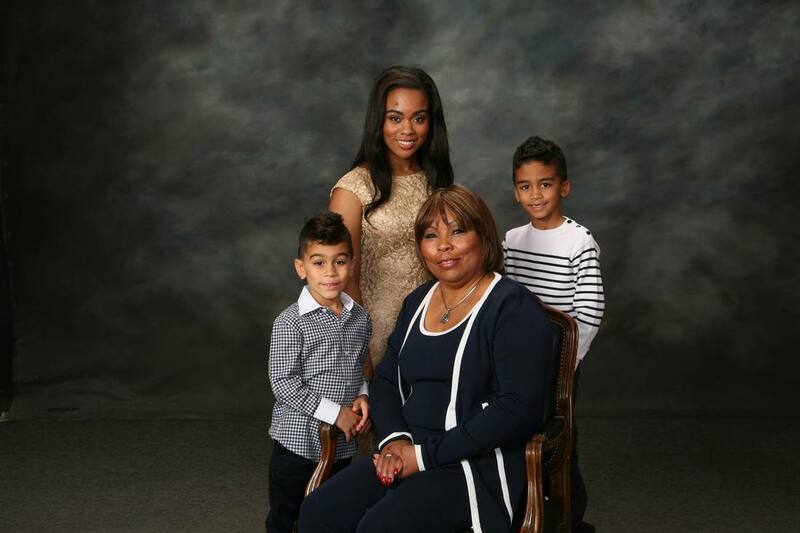 Rose with her 3 Grandchildren Devin Hunt, Gabrielle Erwin and Jordan Hunt. Copa: Please share with our readers how you feel about your grandchildren. 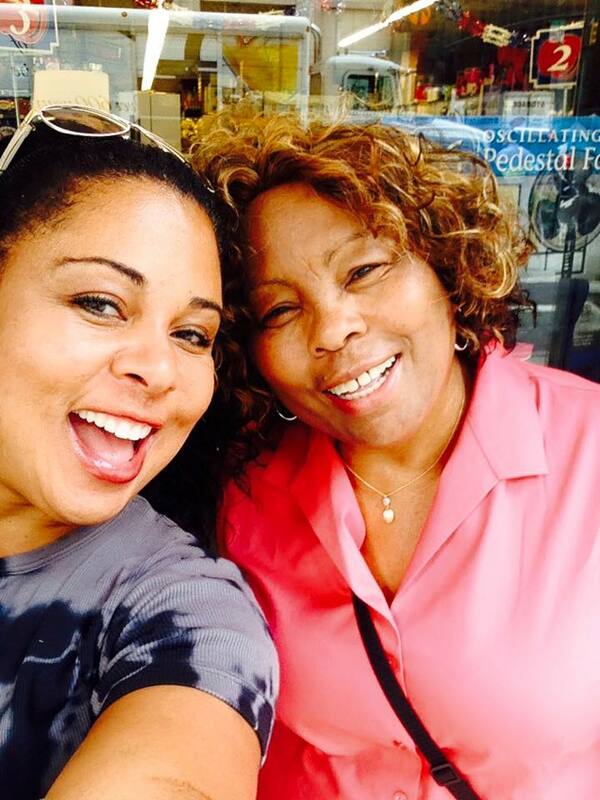 ​Rose: Talking about my grandchildren is my most favorite topic of all. When my daughter had my first grandchild one week before Christmas, and I held little Gabrielle in my arms, I could care less if anything else was happening in the world that day. I think that at that particular moment, the world could have stopped turning and I would not notice. It was a time of celebration like none other for me. I was saddened that her grandfather, for whom she was named, was robbed of the moment. Gabby was everything that made my world a special place. Nothing made me happier than times spent with her. She grew up to be this loving, kind, brilliant, talented, beautiful young woman. She has created a non-profit of her own, and is making her a difference in this world by bringing attention through her artistic talents to mental illness. Gabby was 11 years old when Jordan was born. His birth added a new dimension to my life as a grandmother. My first-born son had become a father with a son of his own. There are really no words to describe the emotions I felt as I watched the face of my first grandson. I fell in love all over again. His maternal grandmother was deceased before his parents were married so was not here to welcome him to the world. I vowed right then and there that I would give him enough love, attention, devotion, nurturing, and caring for her too, as if she were here. I promised my self that I would help his mother as my mother had helped me with my first child. I knew what having a mother figure in your life at the birth of your first child could mean to a new mother. And, of course I had tons of love to go around. I moved across the country from East Coast to West Coast to prove my willingness to help. I was a constant figure in his life on a daily basis from his birth to the present. It was 18 months later that Devin joined his place in the center of my universe along with Gabby and Jordan. He made his indelible mark on my heartstrings from which I will never recover. His infectious laughter captivates me still. His mischievous grin reminds me of his father’s antics at his age. I have a feeling of dejavu each time I watch Jordan and Devin interacting. They remind me of the youthful days of their father and uncle. It is like living Gabriel and Leonel’s childhood all over again. My greatest hope is that they will grow up to be the kind, compassionate, ambitious, loving, nurturing young men that these two role models in their lives have become. If and when this happens, I will know with certainty that I have done my part in helping my son to mold and fashion them into young men of noble character and unselfish service to their fellow man.